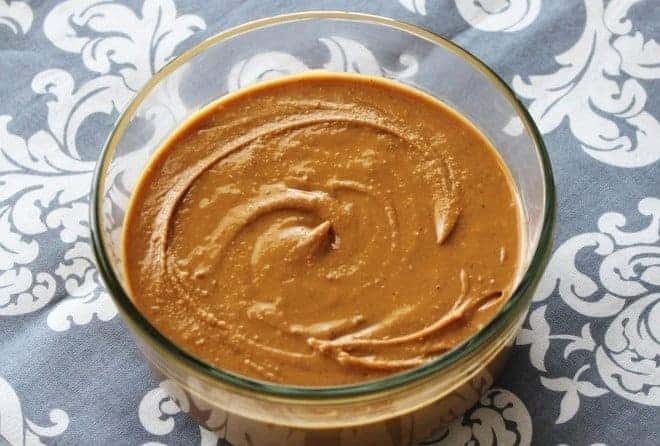 Today I’d like to share my homemade peanut butter recipe that’s been our go-to lately. Making your own peanut butter is a good way to make sure it’s always fresh, plus you get to control the ingredients! A few months ago I brought home a two-pound bag of raw, locally grown peanuts. I wanted to make homemade peanut butter, but didn’t exactly know where to start. Searching the internet gave me a few ideas, but most recipes called for adding more oil to the roasted peanuts as you’re blending them in a blender/food processor. It’s obvious that peanuts already have plenty of fat, so I was wondering if not adding any more oil will yield decent peanut butter. When my peanut butter was done, it turned out absolutely delicious! In fact, it was so good that the original batch of about one pound only lasted a few days before it was gone… Okay, that might mean there’s a bit too much of peanut butter in my diet, but what can I do? This stuff is so good that I’ve been putting it on everything – the classic PB&J, Asian- and African-inspired peanut stews, my Asian slaw salad with peanut dressing, baking recipes… I’ve followed my own recipe quite a few times since then, so let me share the details with you! First, you need to roast your raw peanuts. You’ll need to line a cookie sheet/round pizza pan with a layer of aluminum foil, and make little borders with the edges of the foil. Spread about a pound of raw peanuts in an even layer, making sure they don’t get too crowded. All peanuts need to be spread in one layer. Preheat the oven to 350°F. Based on your oven, the peanuts need to be roasted for 14 -16 min with a good shaking of the pan midway through the roasting. My oven is on the weaker side, so I usually roast them for 15:30 or so. It’s very easy to overroast the peanuts, so be careful! They continue to cook once you take them out of the oven, so it’s better to take them out earlier than later. Once the peanuts are done, let them cool for at least an hour. You’ll hear the quiet crackling sound as their skins start ripping apart. I find the sound very cute :), and the kitchen fills up with a delicious smell of roasted peanuts. These are way more delicious than any store-bought roasted peanuts you’ve ever had! When the peanuts are cool enough to handle, the most tedious part of the process starts: peeling the skins off. Take a handful, and rub vigorously between both hands to get most of the skins off. Put the peeled peanuts into a bowl. Repeat until all of the peanuts are peeled (this might take some time…). Good news: your peanuts don’t have to be peeled perfectly, so some skins left are fine. 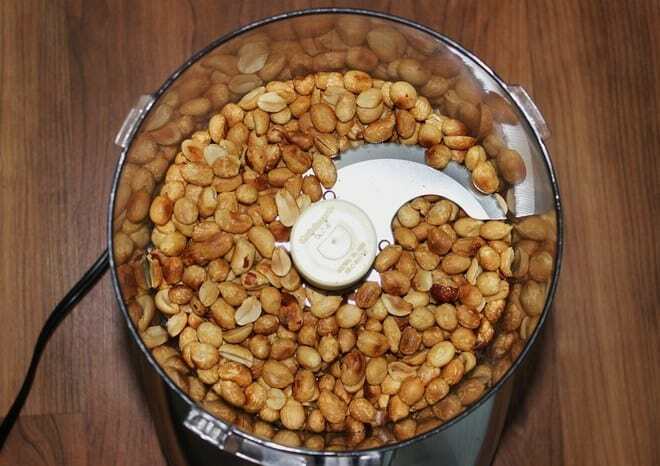 Put your peeled peanuts into a bowl of a food processor with an S-shaped blade (or use a blender). Add 1-2 tablespoons of ground flaxseed and a pinch of salt (or not). Ground flax adds a boost of healthy Omega-3 fatty acids and phytonutrients. Blend the mixture for 5-6 min, scraping down sides every couple of minutes. The color of your homemade peanut butter will vary on how deeply roasted your peanuts are. I tend to overroast mine, so my peanut butter is usually darker. The taste is also a little deeper if your peanuts are ‘on the tan side’. If you prefer a lighter color/flavor, make sure to take the peanuts out of the oven earlier, as in 14-15 min. And now… the printable version of my homemade peanut butter recipe! Making your own peanut butter at home is easy, delicious and healthy! You can use the base recipe and experiment with adding different fillings (see optional list). Preheat the oven to 350°F. 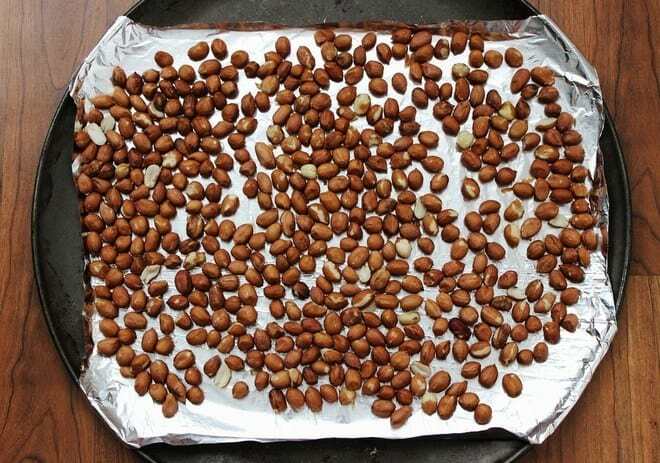 Spread peanuts in a single layer on a foil-lined cookie sheet/pizza pan. Roast for 14-16 min, depending on how how hot your oven gets. Shake the pan vigorously midway through roasting. Once peanuts are done, allow to cool for at least 1-2 hours. When cool enough to handle, peel off the red skins by rubbing a handful at a time between the palms of your hands. Put peeled peanuts in a separate bowl, or straight into the bowl of your food processor/blender. Add peeled peanuts and the rest of the ingredients to the food processor/blender. Blend for 5-6 min, scraping off the sides often, until the peanut butter is smooth. Just before it's done, taste and adjust the saltiness/sweetness to your liking. Store in a lidded container in the fridge. Stays good for 1-2 weeks or longer (see note). Follow the steps for smooth peanut butter, but save a handful of peeled peanuts when putting the rest of them in your food processor. Just before your peanut butter is done, add the saved peanuts and pulse the processor 2-3 times, or until the chunks are the right size to your taste. Store the same way. My peanut butter always gets used up within 1-2 weeks, but I have a suspicion that it may stay good for longer. I can't give any guarantees though, so use at your own discretion. Since no oil is added, this peanut butter doesn't get separated like store-bought natural peanut butters do. No need to stir! Have you ever tried making peanut butter at home from scratch? How about any other nut butters? Let us know in the comments! Tagged peanut butter, vegan, whole food plant based diet. Bookmark the permalink. Oooh, that sounds delicious! Would love to hear all about the results!